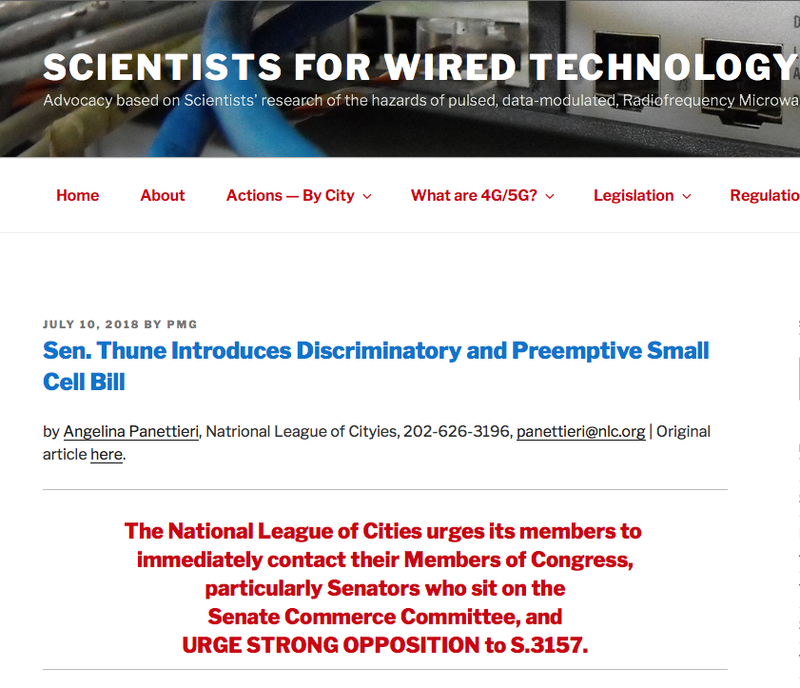 As a community leader and constituent, I express hereby my strong opposition to the “Streamlining The Rapid Evolution And Modernization of Leading-edge Infrastructure Necessary to Enhance (STREAMLINE) Small Cell Deployment Act” (S. 3157). This Bill represents a direct affront to traditionally held local authority. If passed, it would complicate rather than simplify national efforts to expedite infrastructure deployment by mucking up state and local processes. My community shares Congress’s apparent goal of ensuring efficient, safe, and appropriate deployment of broadband technology — fiberoptics. However, S.3157 is not a good way to achieve these goals. Indeed, it is fraught with problems. Despite encouraging “technology-neutral” infrastructure, the Bill is heavily weighted toward Wireless installations over Fiber to the Premises (FTTP). The latter is energy-efficient, safe, secure, reliable and fast broadband — a solution that can easily add Wi-Fi calling for in-building coverage. However, default wireless is not a solution: it produces enormous energy waste with unreliable service. Most importantly, it imposes degradation to living organisms, particularly pollinating insects, birds, bees, and other wildlife, with immediate as well as short- and long-term impairments of human brain, heart, and immune function and disease and early death therefrom. S.3157 would complicate the existing efforts by state and local governments to deploy the most appropriate broadband infrastructure for their communities. Some US states have passed legislation specifically addressing the deployment of broadband infrastructure, and the local governments in those states are busy implementing new ordinances and procedures to comply with those changes. This unnecessary federal bill, questionable under the Tenth Amendment in its impositions upon State and local governances, requires a poorly conceived, one-size-fits-all preemption of those well-meaning, detailed, in-process municipality efforts. Instead of benefitting the local communities, it enriches wireless companies to the detriment of companies offering wired solutions. S.3157 would force expensive, new Wireless deployments, when FTTP is most effective and in many cases in place, ready to be connected. S.3157 imposes unfair timelines on local governments. The shot clocks proposed by S.3157 are draconian: considerably shorter than those the federal government applied to itself in the bipartisan MOBILE NOW Act. The reduced size-per-installation of so-called “small cell” infrastructure, which is in fact of considerably large overall, does not translate to a reduced procedural burden on local governments. Municipalities must still review each site individually to ensure it meets the local jurisdiction’s requirements and needs. Further, the limited extension for small jurisdictions and bulk requests of typically over fifty simultaneous applications does not address these resource challenges for states and local governances. Finally, limiting fees and rates to direct and actual costs is an extreme overreach by the federal government. Municipalities negotiate with providers to ensure appropriate compensation to taxpayers for private, profit-generating use of public property and to incentivize development that benefits community residents. In some cases, state constitutions’ prohibitions on gifts to private entities prohibit cities from assessing less than a fair market value for rental of public property. When cities are prohibited from controlling these rates, they are forced to subsidize private development, at the cost of other critical local services such as road maintenance and public safety. Such overreach could devolve into judiciary challenge that is best averted now. For these reasons, I am opposed to S. 3157 and urge you to oppose it. Local governments need time and flexibility to ensure that the broadband infrastructure most appropriate to each locality is deployed not just quickly, but safely and correctly, in communities throughout the nation.